We raised our glasses to the Regiment and Sir Charles on the anniversary date of the battle on Feb. 17th once again at Finnagles in Clinton NJ. This was a very relaxed event geared to shake the rust off and work on kit and interact with the public. We had five men and a musician show up for the 22nd. The event started at noon on Saturday. 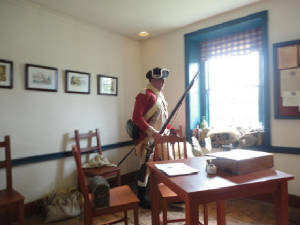 We quickly took over the Campbell-Christie house for our Guard Room and eventually tavern and sleeping quarters. We eventually had a first formation and posted sentries. 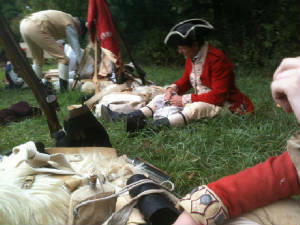 The 22nd took the first round then stood down to work on kit, chop wood or practice drumming after they were relieved. We later reformed to the sound of the long roll and Sergeant Krentler led the combined NJV/22nd on a drill and firing demo. The public portion of the day ended by 4:00 PM and started preparing for the evenings fun. Sergeant Krentler was responsible for the beer and we were not disappointed. As mentioned before Todd Braisted created a wonderful supper (even my finicky 13 year old wolfed it down). One of the highlights of the evening was a ghost walk led by Kevin Wright of HBNL attended by all the children of the regiment who attended the event. Finally some tired but contend soldiers gathered in the tavern for good company, song, good ale and ribaldry by John Torkos. The Sunday schedule was the same as Saturday so we had a relaxed morning with another great meal. 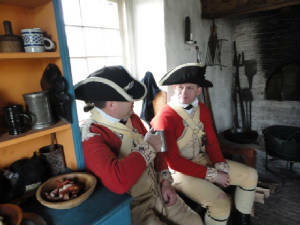 We cleaned up from the previous night and started interpreting soldiers spending time in a tavern while it rained off and on outside. There was more interaction with the public either one on one or in small groups. 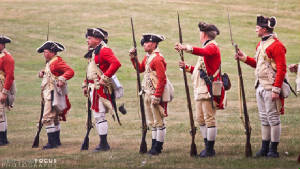 John Torkos, (The Mouthpiece of The Regiment) gave several firing demo’s while tracing the origins of the American Revolution back to the Barbarous Sixteenth Century. 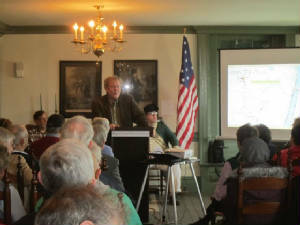 The highlight of the day was a lecture on the 1780 raid into New Jersey by the British by several lecturers including our friend Todd Braisted. Judging by the standing room only crowd in the Von Steuben House it was a great success. There was no problem with registration as those who were not in the BAR were admitted as invited guests of Fort Ti. In my opinion the British had the better camp site which was below the fort in the King’s Garden area. We set up camp on level ground in an apple orchard. The apple trees provided cooling shade and an abundant supply of apples. A favorite gathering spot for the men while not on duty was under an apple tree in our company street. Our kitchen/tavern was set up a short distance away. We could see the lake through the trees and there was a pair of osprey nesting nearby and they were constantly above us. First formation was at 8:00 AM which caused some grumbling in the ranks. I sized the company and we did a little drill then fell in with the brigade commanded by Ken Siegel. Steve was the Sergeant Major and he formed the Army then fell back in with us. There was a brief moment of silence for the victims of the shootings in Aurora, Colorado. 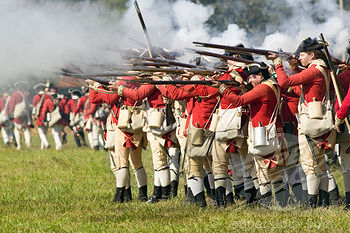 After first formation our brigade - 22nd Hessians and the Foot Guards - did some drill in open order and passing through ranks. We had the first piquet after formation so we went out right after drill. There were posts at the two entrances to the Kings Gardens area. The Rebels were behind log works along the old French lines within long musket shot of the lower post. Half of the company stayed in reserve in case one of the piquet posts were attacked. I was with the reserve and from what I could tell there was not much action. We were relieved after about an hour on duty. Our second piquet was around noon and we split the company evenly without a reserve. Sergeant Krentler took the upper post and I took the lower post. An immediate exchange of verbal abuse commenced between soldiers in the lower post and the Rebels behind their works. If you approached too closely the Rebels would take a shot at you but for the most part there was little interest on either part in engaging in hostilities. I should mention here that Private Hagist showed great initiative in drawing the enemy’s fire in an attempt to determine their numbers. It pains me to report that this same private abused his NCO, namely me, and incited other members of the piquet to do the same by throwing stones of increasing size and weight at the “sentry box” while his Corporal was in it! We went right to the battle from our guard. We started the assault in the center of the line using our open order tactics of passing through the other companies. 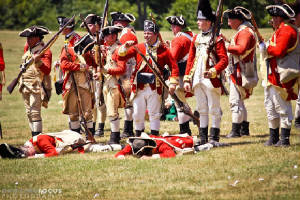 We were in a single rank and fought with the Hessians and the Guards. The lights and loyalists were on the right and the Burgoyne battalion was on the left. We advanced, were repulsed then advanced again. When we were close we were ordered to work our way around the Rebel left along the log palisade where we got around it at the top. When we were through the Rebel lines they had already left to the top of the hill just below the fort. We gave chase and continued to engage them in a running fight continuing to flank them and forcing them to move. Eventually there was no place for them to go and with the threat of our bayonets they were forced to retire back into the fort. Unfortunately for the Rebels, our Royal Artillery hauled cannon to the top of Mt Defiance that evening. The battery looked down on the fort and made the fort untenable. 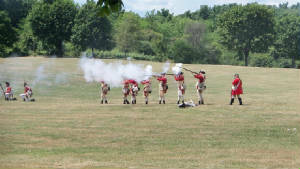 The cannonade began Saturday evening and continued on Sunday. Back at camp we were soon sprawled out under the shade of the apple tree as the heat had accomplished what the Rebels could not. We had a cold but filling supper of ham, chicken, sausages, cheese and bread washed down with a fine summer ale captured from one of the Rebel units from Boston. 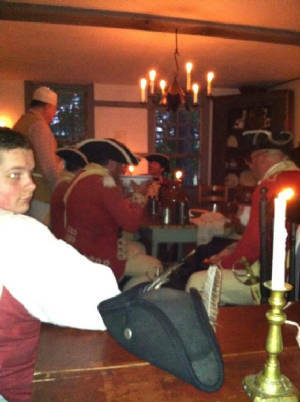 As the evening progressed Sergeant Krentler opened his tavern and there was much singing, jollification and visiting with old friends. Sunday morning was greeted with the joyful news that first formation had been pushed back to 10:00 AM. There was much rejoicing. After formation the Sergeant took us on a little stroll and drilled us in some of the finer points of the manual of arms. We then had some down time as we had the last piquet before the battle. Nothing of any consequence occurred during the piquet and we followed the army out onto the battlefield. The battle was much the same as the previous one. We fought in open order passing through the other companies. When we were close we were ordered to storm the log palisade. Unfortunately there was a brush abatis that we had to work our way through or around so we had to reform then continue the attack on the enemy’s sally port. When we were through the Rebel lines who should be to our front but the Third New York Regiment led by that notorious Rebel Andrew McClain. We traded a volley with them and they retired. 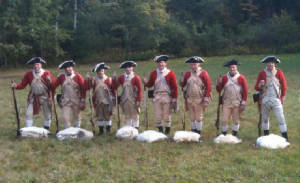 We were about to give chase when we were ordered to the far side of the palisade and followed the Hessians up a goat path. At the top we forced a vastly outnumbered group of Rebel Militia to retreat and followed the same plan as the day before with one unite forcing the rebels to move while the others made sure they went where we wanted them to go. A final application of cold steel sent them on their way to Lake George. What a great victory! All that remains now is to cover the few short miles to Albany. This Weekend the 22nd Regiment participated in the Eastfield Village immersion event. In the field we fought in close order, open order, from tree to tree, in line, in two ranks and in two independent squads. The terrain changed from woods to cart paths, to open fields to wood roads and even a farm yard. I’m very proud of the lads. After hostilities had ended we were set loose on the village and the Paymaster, Quartermaster, Grand Suttler and former owner of the Yellow Tavern were glad to see our backs on Sunday. I’m Very Proud of the lads. Detailed AAR to follow. I wrote the above on September 24th 2012 and it is now January 1st 2013 so I will have to reach back in memory for this one. My apologies, this one is a little all over the place. Some of us arrived on Friday night and set up a modern camp in the field where we parked the cars. 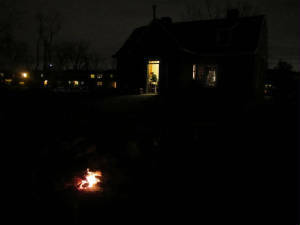 It was clear and cold and I was glad to have a sleeping bag and wondered how the boys and I would fare with just blankets tomorrow. The Saturday arrivals started showing up early. We got some hot water going on the brazier and started to kit up. We had nine men, Steve Krentler, Lou Lustenberger, Bill Hague, Don Hagist, Chris Tintle, Dave Mutter, Gavin Joswick, Stephen Joswick and I. 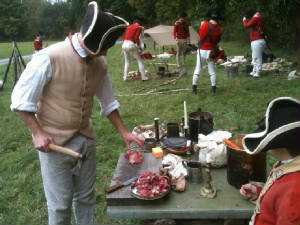 We were issued hard rations before we marched into town consisting of bread, meat, cheese and rum. Mr. Muller was keeping a careful eye on us and I was only able to secure extra rum in the form of Gavin and Stephen's rations. For some reason this year we went right to town and set up our camp before the tactical. We would also have our pay call and be issued our uncooked rations before the battle. This seemed a little backwards to some of us but the 22nd is easy to adapt. First came pay call where we would be issued our pay in accordance with our rank and less any stoppages that Sergeant Krentler deemed were his due. This money could later be used to supplement our rations or in the tavern that night. 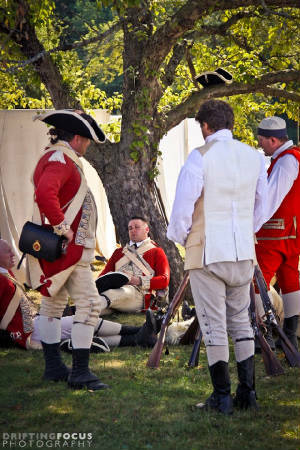 We were careful to go in squads of around four men, of which we were able to contrive, by the artful shifting of regimentals and headgear, at least three squads out of the eight private soldiers present. Also, imagine my surprise when I was called to receive my pay and found that I had been promoted to sergeant. Indeed it seems that the entire company had seen some sort of promotion except young Stephen whom the best of art could not disguise as more than a common soldier. While the pay call was going on, the fire pit was set and an elegant table was fashioned from a large piece of slate that we found. It was about this time that we first started seeing candlesticks appear on the table. 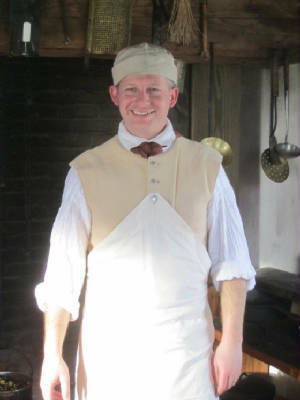 It seems that in spite of his vow to be watchful of the 22nd, Mr. Muller and his Yellow Tavern staff could not thwart Sergeant Krentler's quick hands. When it came time to draw rations of beef, dried peas, butter and vinegar it was much the same as before. We went in variously disguised groups, creating as much confusion as possible and even managed to acquire some root vegetables for our dinner without the required payment. As we pooled our food together to cook in our mess kettles we also noticed more candlesticks and even wall sconces appear on our table. Quite elegant. During this time I walked back to the Yellow Tavern with a lemon I had saved from the last tavern to see if I could trade it for another potato or two. There I noticed Private Mutter attempting to climb up to a window in the tavern that was just out of his reach and making a bad show of it on account of an old bayonet wound in his side that was slow to heal. I asked him what he was about and he pointed to the windowsill were sat a bowl brimming full of brown eggs. Well I'm as partial to eggs with my breakfast as anyone so I offered my back which gave him enough height to take up the bowl. Almost immediately there arose a clamor from the kitchen in the tavern so I told Mutter to be on his way. I hurried around to the other side of the tavern where the door was and was immediately met by an angry woman declaring that someone had just robbed her of her eggs. I attempted to help her call the Town Guard but it appeared that the officers had not set one. I then told her she had best go find an officer and left after I had traded for my potatoes. We were soon ordered to prepare for the tactical. 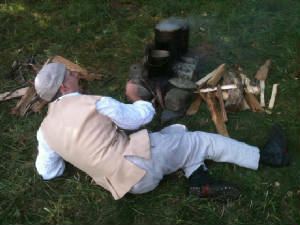 Private Mutter would stay to cook dinner as his wound was still bothering him. As I said before it seemed a bit backward to set up camp with them, draw pay and rations with them and then go out and fight them but it did add more opportunities for us. It seems that the Rebels were foolish enough to go to pay call and to be issued rations all in one group leaving their camp unguarded. 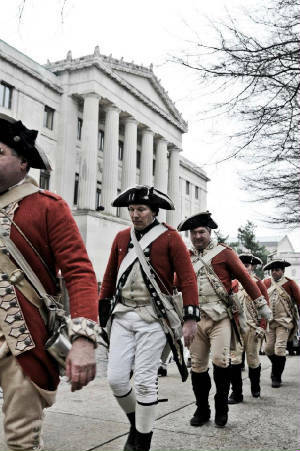 Imagine their surprise when they went to take up their muskets and found that there were no flints in them. We eventually helped them out or else it would have been a boring tactical. As I mentioned earlier it was a fight tactical with a lot of fighting in constantly changing environments. Woods fighting, open field fighting, across stone rows and down paths and woods roads. Between us, some Rangers and the 40th Lights we pretty much had them on the move most of the time. The fight started on a hill across from the village and worked its way down to the road leading to the road into the village. The 40th was trading volley's with them at the intersection which was in the form of a tee with the base of the tee the entrance into the village. The top side of the base was flanked by a farmyard and barns on our side and a large pond on the other. As the Rebels fought the 40th at the corner and started to move down the village road between the farm and the pond, Sergeant Krentler took the 22nd on an angle through the farm, masked by the barn, so that we got into the flank and rear of the Rebels. They were trapped between the pond on one side, a stone ramp to the barn on the other, the 40th at the intersection and the 22nd between them and the village. We marched them into the village with their muskets clubbed. Dinner still had some time to go when we got back to camp so we cleaned muskets and kit. Sergeant Krentler went to help tap the keg at the tavern and returned with some ale for our approval. When supper was ready we all tucked in heartily with many compliments to Private Mutter for a job well done. You would hardly credit it, but up in the northern woods in September it gets dark early and sudden like. Soon we noticed people from the Yellow Tavern making inquiries about candles and candlesticks. Of course we had no idea what they were talking about. Then a Gentleman came around and said he would make it worth our while if we could find the candlesticks and get them back to Mr. Muller. Since this Gentleman was a little vague about what was in it for us, Sergeant Krentler sent him on his way and we waited to see who would show up next. Now came several Officers and although they made no direct accusations there were pretty sure that the 22nd had the only source of light for the Yellow Tavern and they tried to reason with us as best they could. It was the young Officer of Engineers who thought he had the Sergeant's number though when he started naming sums of money that made its way to twenty Pound or so. We were ready to be reasonable with the young Officer and offered to do our best to find the lost candlesticks and candles for the twenty Pounds if he had ready money on him. He said that indeed he had and reached into his waistcoat pocket to produce the money. Finding nothing in the one pocket he reached into the other and came up empty again. This puzzled him very much since he was sure he had the money before setting out to see us. And we knew he was right but we had also seen Dave Mutter pick his pocket a clean as a whistle and hand me the money behind his back which I then passed to the Sergeant! Finally Mr. Muller reluctantly came down to our camp to bargain for his lights. It must have been a long walk because he knew it would cost him in rum and ale and in pride since he had boasted how the 22nd would not get one over on him again this time. So we went to the Yellow Tavern again. What a brilliantly lit establishment it was too. There was good ale and best rum punch. There were sausages and eggs, pies, cakes and cookies. There was singing till we were all horse. And in the wee hours, as Mr. Muller sat with Sergeant Krentler over one more bowl, the Sergeant bought the tavern! What is every soldiers dream my boys? Why to get his pension and set himself up in a neat little tavern someplace. 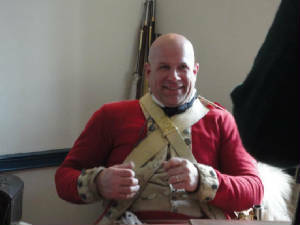 Now, thanks to the Sergeant, the 22nd Regiment had it's own tavern! As neat a little tavern as you could wish, complete with serving wenches and a fine though surly cook. The only fly in our ale was that we weren't quite out of the Army yet. Well we made the best of it as we could, drank all the profits and left with no regrets. Maybe some day we'll be back. We had five men under arms for this year's battle. We fell out with The NJV and stragglers from the 23rd and 55th Regiments for a combined company of thirteen. The fight started in driving snow and ended with rain and sleet to add a dose of reality. There were no problems with travel as the roads stayed clear. The first battle went as usual with the Rebels pushing the Crown Forces down the city streets. The pace was quicker than in recent years with the troops falling back and passing through each other in open order. Again the snow, which was heavy at times, added to the reality and made effective musketry a challenge. 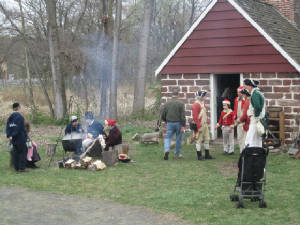 We allowed the Hessians the honor of surrendering to the Rebels while we started thinking about lunch. The 22nd's ability to forage is, of course, legend, and we were on our game once again. 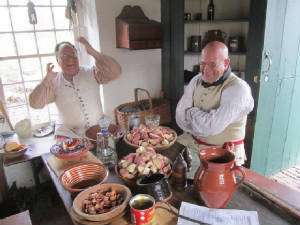 In spite of the conditions we were able to follow our noses to a tavern about two blocks from the barracks and enjoyed a warm and dry lunch while watching the snow fall outside. After lunch we went back to the barracks to view the displays in the museum. By then the snow had pretty much changed to rain. Rich Patterson took a poll of those in the courtyard and it was decided to carry on with the rest of the afternoon's activities. As usual, we marched to the Presbyterian church and rendered honors to Colonel Rall and the fallen on both sides. 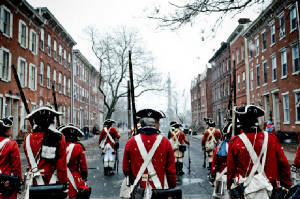 The second battle of Trenton commenced shortly after and it was our turn to pursue the Rebels through the streets of the town down to the Assunpink Creek. The Rebels set up a strong position on the opposite bank and were able to repulse three determined assaults before it was decided we would try again next year. After being dismissed Lou Lustenberger, John Torkos, Tim Kuntz, Gavin Joswick and I went to Triumph Brewery for some hand crafted ales and dinner to finish off a good year of living history. 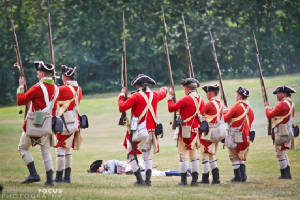 January 2013 will have your fearless leaders at the British Brigade and Continental Line planning meeting to begin finalizing our 2013 schedule. February we will have our Meeanee Day Dinner probably at the usual location on the 15th or 16th. The 17th is a Sunday so there is a possibility of doing a luncheon instead of dinner on the actual date if there is interest. Let me know.